Notice regarding the Change of Exam Center for B.A. part I(Non-collegiate) of sociology Paper I & II for examination 2018. Notice regarding B.A. Pt. I,II & III(Honours) Geography Practical Eaxm-2018,University Rajasthan College,Jaipur. 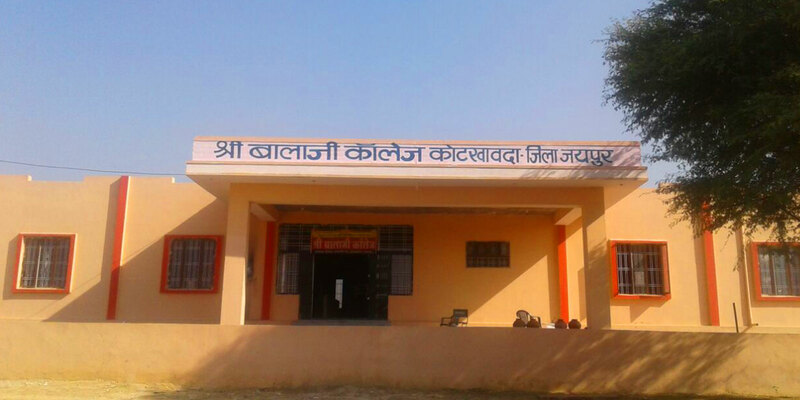 Sri Balaji College (Private) College is one of the most reputed institution in Rajasthan located in Kotkhawda Jaipur. It is known for its quality education, knowledge enhancement and excellent infrastructure. The institution is spread across 2 acres of area in city Kotkhawda. It has adequate infrastructure in the form of excellent building, class rooms, library, conference halls, seminar rooms, sports facilities etc. The institution has developed proper infrastructure and learning resources to cater the need of imparting theoretical and practical knowledge as well as promote research activities. During the period of last four years college has spent more than 25 laks on the development of infrastructure for academic activities. Huge underground parking facility for both faculties and students for two-wheeler and four-wheeler is a special feature of college. More than 500 vehicles can be parked at the same time. For the security of the vehicles 24 hours CCTV cameras are activated. About 4 to 5 guards are always on the duty for security of the vehicles.